This list is Based on 12 important metrics of most popular programming languages in 2016 to give you a proper insight for best use. Each metric describes various horizon of popularity. Since we consider different parameters to be important for ranking like, Which programming language is hot there in open source? Which programming language guarantees promising payback and their job market? What top programming languages to consider for dynamic websites? Which programming language fulfill requirements of the application you want to develop?Which programming language promises maximum learning curve. These metrics have been merged to modify a single ranking list ensuring various concerns of our readers. Furthermore, you can filter your interest looking up for languages used in Enterprise, Embedded Systems, Mobile or Web applications. After a gap of 2 years C left Java behind for top spot. 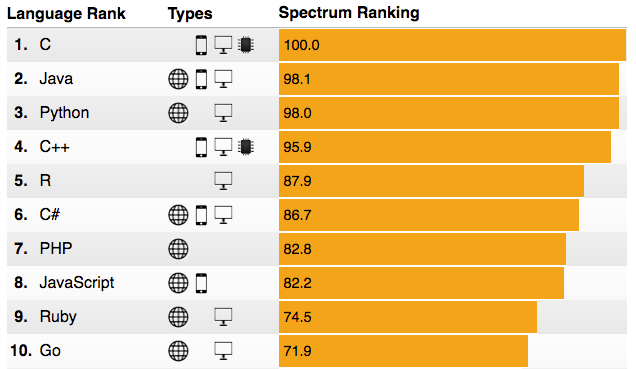 Python, C++ and R have also reserved their space in top 5. Interestingly R is new member of top 5 after pushing C# to 6th spot. Google and Apple with their Go and Swift respectively are trying pretty hard to be considered among top 10. Swift made remarkable jump of 5 spots to secure 11th spot but, couldn’t out rank Google’s Go from 10th spot.Other striking difference is made from Ladder Logic reaching 34th spot improving 5 positions to last year. HTML continues its popularity by capturing the 16th spot. On the low side there is a shocking decline regarding Shell programming popularity. It has fallen to 19th spot losing seven positions. It raises a concern regarding cloud-based data centers but let’s be calm and hope for next year ranking to get a more concise reflection of statistics.